There’s a ton of noise online today. How are you going to stand out? This is a question many aspiring influencers have. They have a message they want to get out to the world, but it stays bottled up inside of them. For example, a few years back I discovered that my unique ability was a combination of resourcefulness and practicality. I enjoy taking complex topics and breaking them down into simple, teachable steps. My main outlet for creating value with my ability has been publishing blog posts. Later, I scaled into podcasting and video creation. How can I best create value for others? Finding your unique ability is outside of the scope of this blog post, but I want to answer the second question. An effective way to create value for others is through regular, consistent blog posts. At least once a week, you should publish a new blog post that answers a common question your audience is facing. Today, I want to share with you how I execute on a weekly blog post from idea to execution. The key to doing this consistently is to create an editorial calendar. I’ll show you how to do this using Asana and CoSchedule. You might be wondering why I use both Asana and CoSchedule. 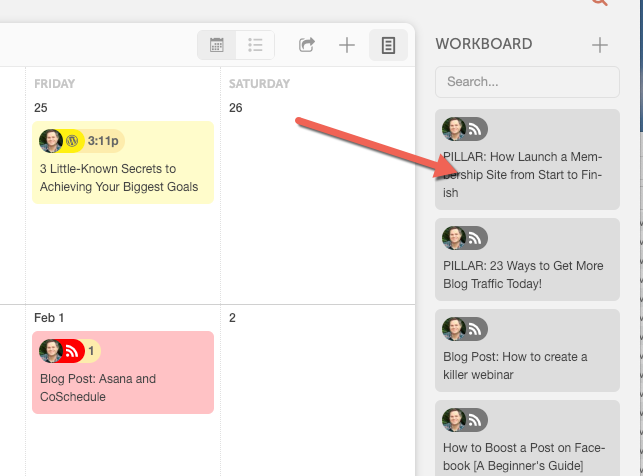 I use Asana for the blog post workflow, and I use CoSchedule for the editorial and promotional calendar. I prefer to use Asana for the workflow because I have team members to whom I outsource most of the process. Pro Tip: Have a goal of only touching two parts of the process: selecting the topic and writing the first draft. Let your team (as you build one) do the rest. There is no perfect system when it comes to creating an editorial calendar. What is important is that you’ve intentional designed a workable system. Below is a screenshot of how I have this set-up in my Zapier account. Second, I can see my draft blog post now appears in the CoSchedule “Workboard” section (see image below). In the next step, we will schedule the blog post onto our editorial calendar. 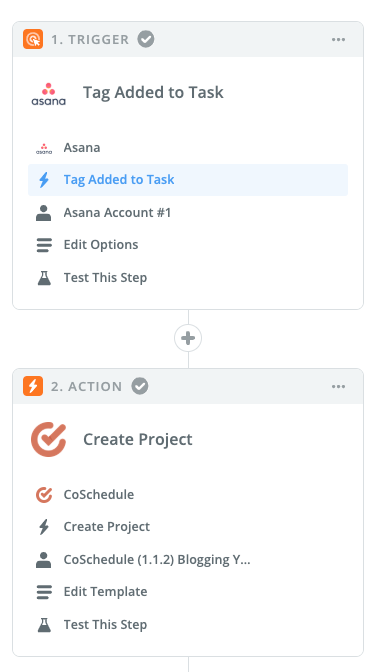 Now, all of your ideas live in both Asana and CoSchedule. Once inside CoSchedule, you can begin to drag and drop your ideas onto your editorial calendar. Just by assigning due dates to your ideas, you can reduce the overwhelm and focus on what to do next. Personally, I like to write all of my blog posts directly in CoSchedule. Since it is integrated with WordPress, this makes it easy for me. Once my draft post is ready, I can click a button and convert my content into a WordPress post! The number of steps you use in writing, optimizing, and scheduling your blog post is entirely up to you. If you want to see our process then be sure to check out: How to Create a Blog Post Checklist in Asana. Whether you use our system or one that works for you, what matters most is flow. Is your system overly complicated? Does it have more steps than it needs? If your system and workflow include these two things, you’ll create consistent value as you get your message into the world.